It has been an exciting summer this year. We now have an added member to the Dionne Quiltuplets. My first granddaughter, Elizabeth, was born in July and I am so enjoying her and seeing her grow. She is our youngest member so far and she is definitely benefiting from all our craftiness. To address the first solved mystery – last February, I posted about “My Stash” (and, yes , it is still growing.) At the end of the post, I mentioned that I had a fabric that I really liked. What could possess me to use this piece of fabric when I knew that the recipient would probably never notice, and it would be thrown on the floor and washed many times? The gift was a hooded towel for my granddaughter. 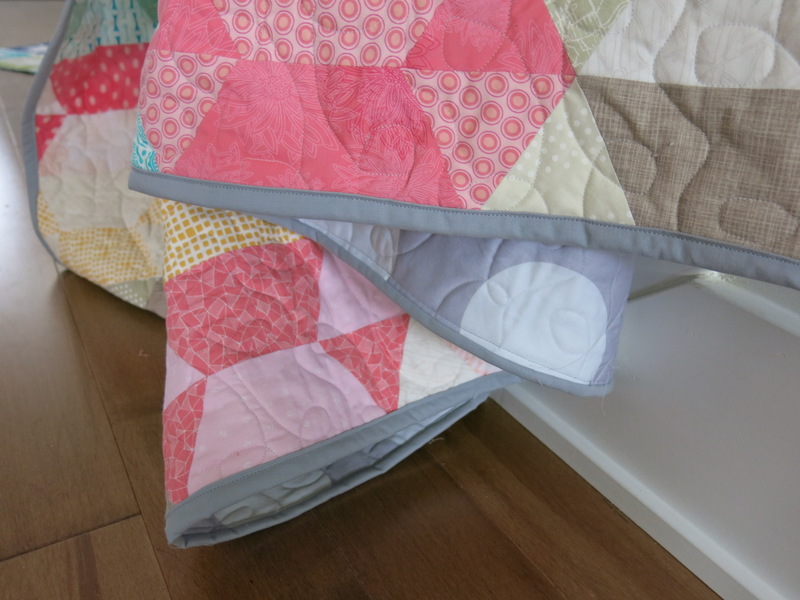 I used this fabric for the binding. 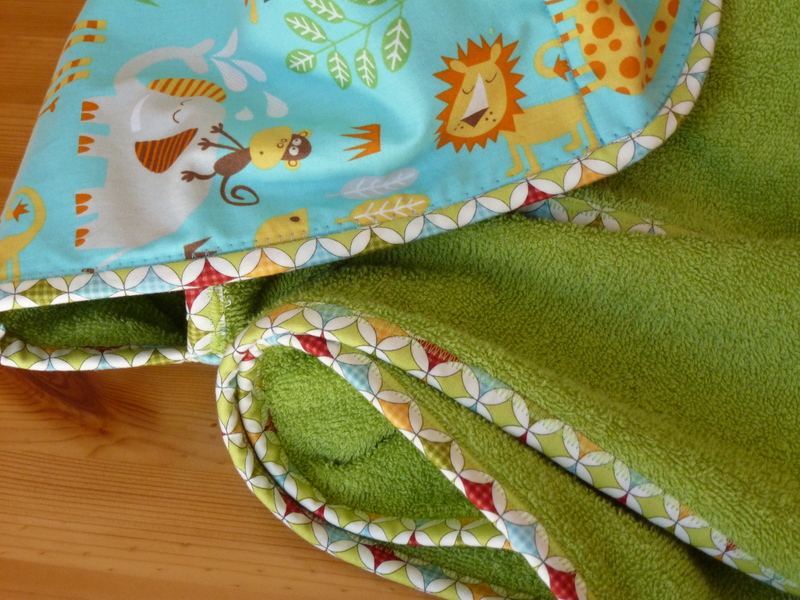 I had chosen the towel and the hood fabric and when I auditioned my fabrics for the binding, this was the best choice. I was only too happy to use it. 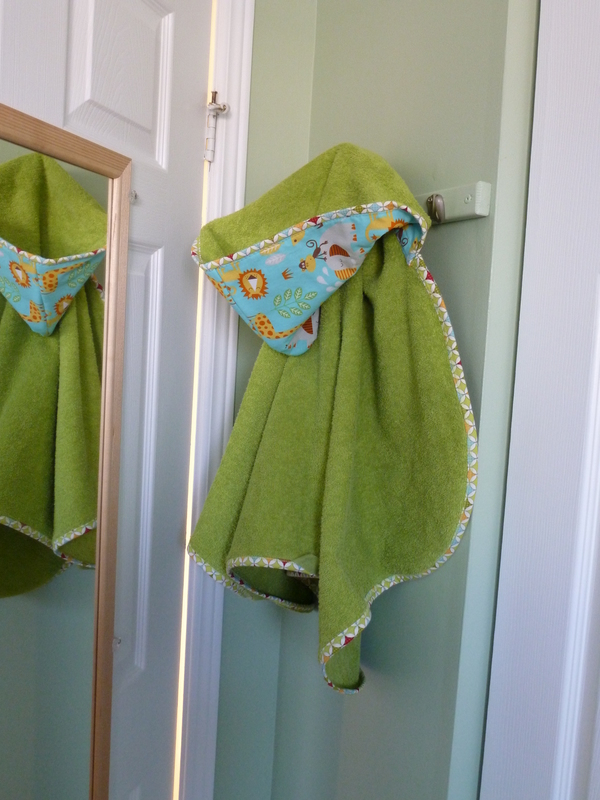 The pattern and instructions for this hooded towel is found on the “Stitched in Color” blog (under tutorials, “Repurposed Hooded towel”). I love how Rachel creates all kinds of colourful items. The only comment that I would add is to use a hand towel that is not too big, otherwise, you will have a huge hood. 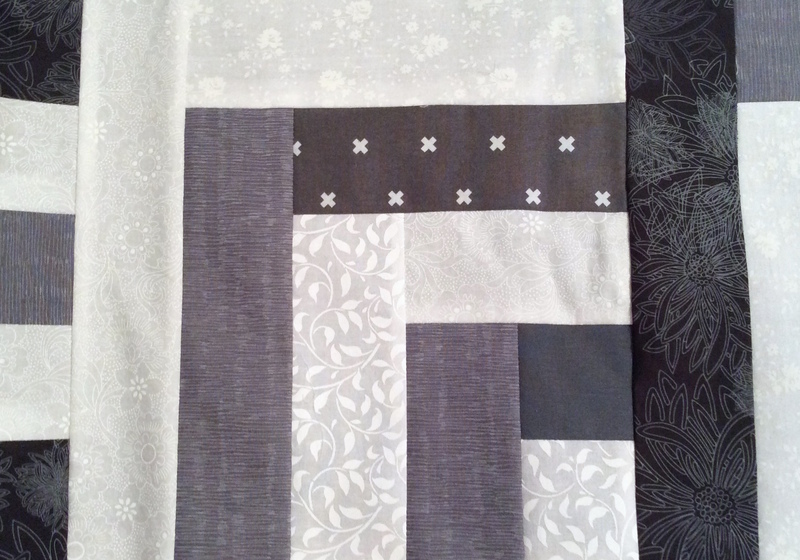 I am using colours that are darker than the pattern calls for, but I wanted to use fabric from my stash. 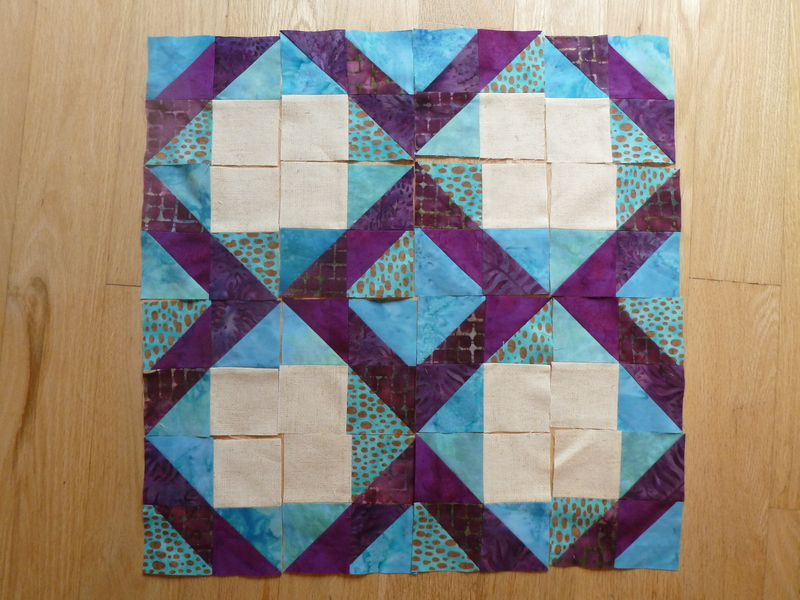 And here is the confession, I had to get a bit more fabric so that I had enough of each colour. But I am really excited about this project. Every Friday night, I have the instructions for the coming week. I am impressed so far, as the instructions are very clear. The first week was cutting the fabric. There are 1325 pieces. The only change that I made was to keep the squares for the half square triangles whole instead of cutting them in two. The pattern even includes letters for each type of square. The second week was making squares (40) out of the half square triangles. And having fun with the pieces. 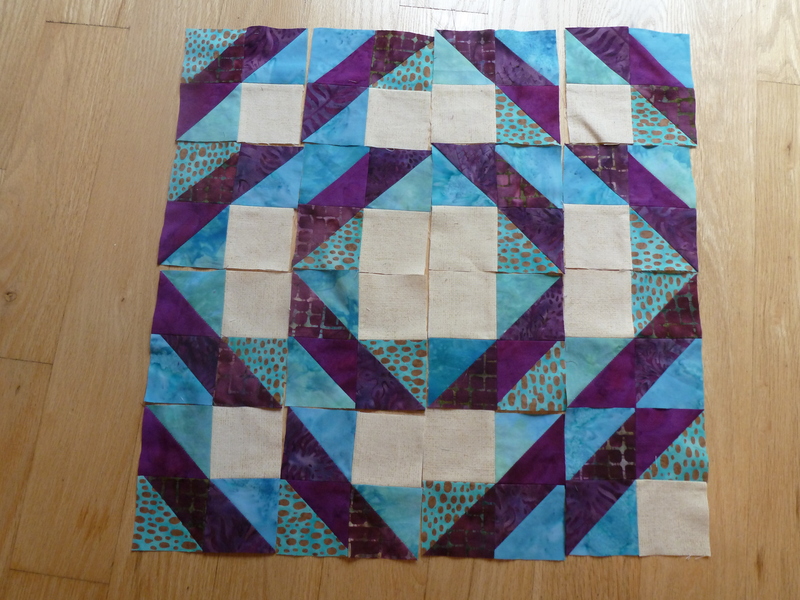 The pieces look purple/aqua so far, but my whole quilt is more in the fall colours. 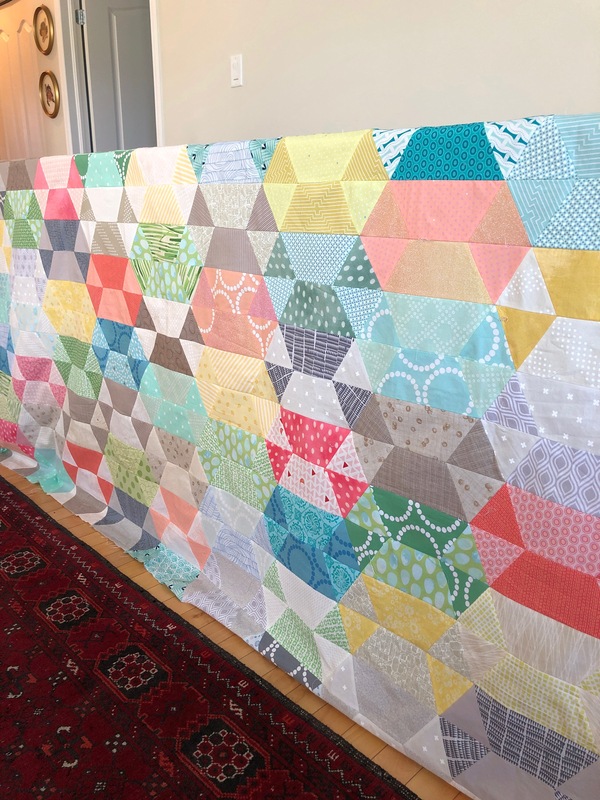 There is still time to join this mystery quilt. – A quilt store to pick up batting for my mother. While I was there, I saw so many original prints. They just hopped into by basket. I am also trying to build up my stash in the colours of which I have few. (Well, few depends on the beholder.) And what a selection of unique books! – Yet a different quilt shop to pick up fabric for my sister. I was honestly doing her a favour. I seem to be low on plain fabric so this was a good chance to pick up some fabric with warmer colours. But alas, there was a sale on some fabrics. I really did get a good price. – Back to the second quilt store. 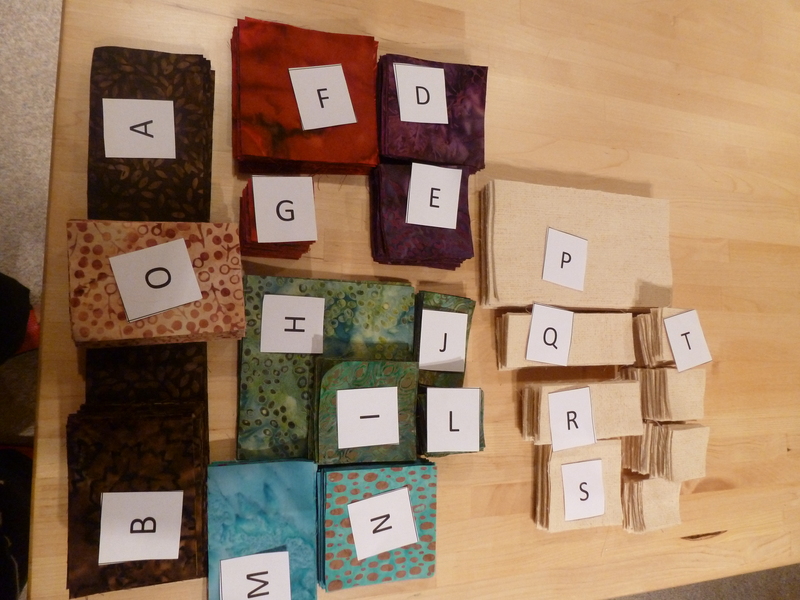 I was just in to get a few fabrics for my challenge quilt. Oh, I have not told you about the challenge in our guild. 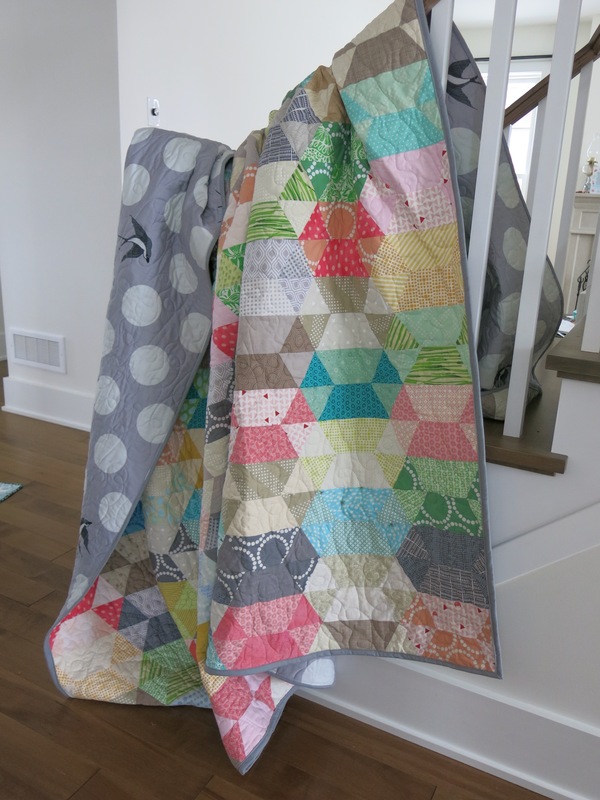 Our guild is having a big quilt show in May and of course they need lots of quilts to display. 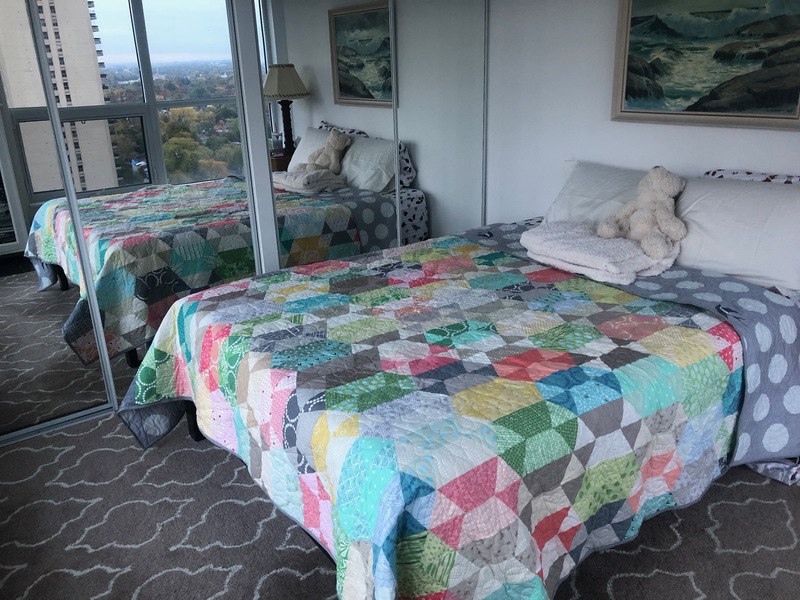 One of the categories for display is the quilt challenge. 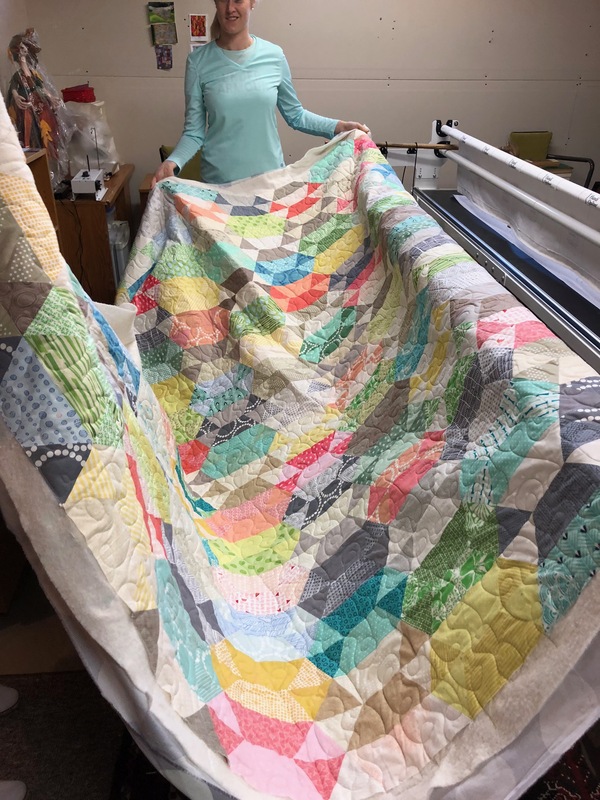 This year, the challenge is that you can make any size and type of quilt you want (bed size, runner, wall hanging, clothes) but you need to include the participation of someone that does not quilt. I have heard from others and on blogs that you learn much from being pushed to do things that are not in your comfort zone. So, isn’t is great that I decided to take on this challenge! Well, back to my original reason for going to the quilt store. I needed to get some fabrics for this quilt. But when I got to the store, there was a big event that afternoon. Yes, there were several different areas displaying different quilting techniques. How cool is that! I even had to go home and come back with my daughter. Well, I was a happy shopper again. If you have not noticed, I have a weakness for fabric. Beautiful fabric!! Now to know me is to understand that I am very good at budgeting, saving and being organized in my finances. 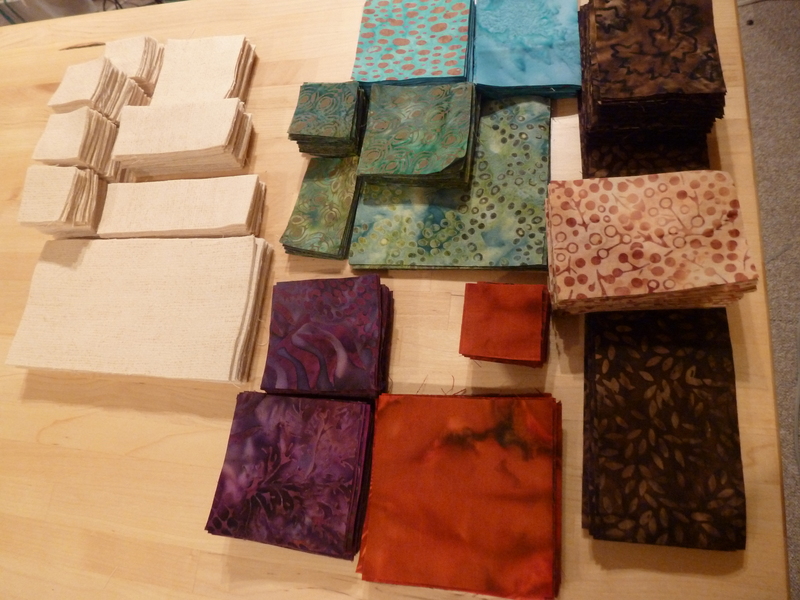 So if you consider my stash as my bank account, you might also appreciate that I might hoard some of my more beautiful fabric, especially when I have a small piece. I tend to imagine that I will make something so beautiful with it, that the colours will inspire me and that the finished product will be wonderful. I think that I dream in Technicolor. Or perhaps, I should say technifabricolour! The other day, I was working on a project that was not grand, that was going to be washed very often and that was probably not going to be admired a whole lot. I was auditioning quite a few fabrics. And then, I auditioned a fabric that I have been admiring and of course hoarding. I loved the colours of my fabric. 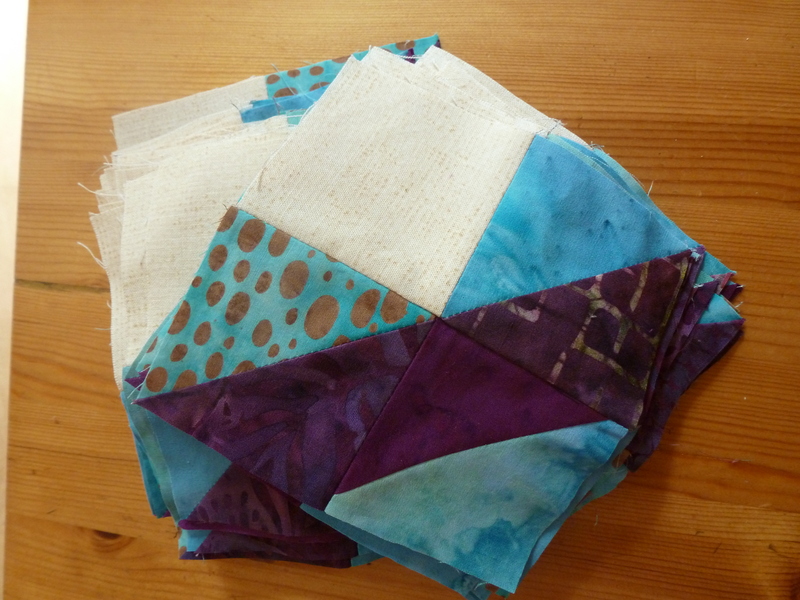 This fat quarter was going to be the inspiration for a quilt. The cathedral window pattern, which I have yet to try, is one of my must try patterns. But over all, I saw much potential from this little piece. Hmm! 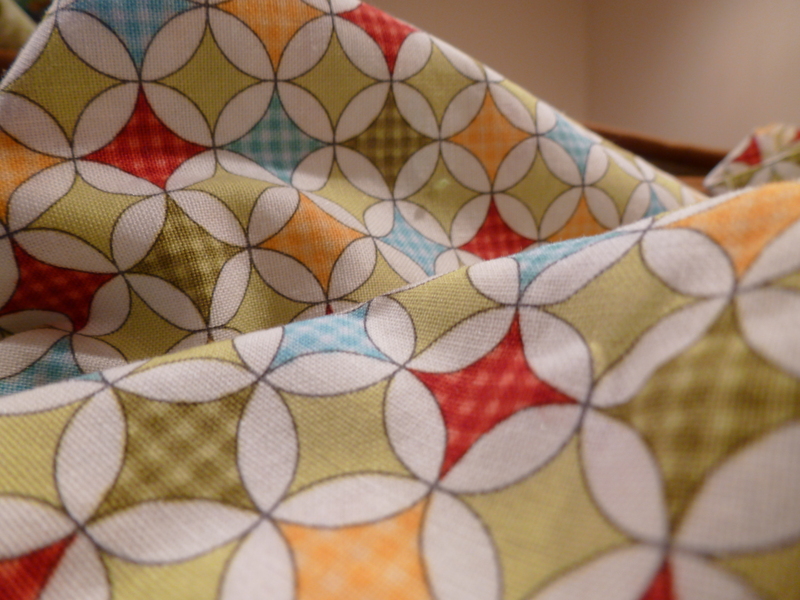 Well I kept on auditioning fabrics, but kept on coming back to this fabric as it seemed to brighten up the project. So here is my fabric. It might not be much to you, but I had a soft spot for it. So, I cut up in pieces. What would possess me use a fabric that I really liked for a something that was not grand?